Fermenting is easy, simple, and usually straight forward. While it can benefit from special tools, like an air lock, those are not necessary in small-batch fermentation if you keep a close eye on it. In the right conditions, you can make a quart or pint of kosher dills, or pickled cabbage, within three days. Eat them for a week or two, and then make a fresh batch. Your gut will be extra happy, and you’ll have some added zest in your meals. Most people think of naturally fermented cabbage as sauerkraut. This recipe however is for pickled cabbage, not sauerkraut. So, what’s the difference? Sauerkraut is made with salt and cabbage. The cabbage is shredded, packed down in layers with salt and pounded to release the plant juices. This pounded salt and cabbage mixture is then fermented. Sauerkraut takes more than a month to ferment, even in small batches, and can take an extra month after the ferment is finished to taste good. It can go a little faster if whey or some juice from a finished ferment is added. Pickled Cabbage is made with salt, cabbage, possibly garlic, and water. Making pickled cabbage uses the same process as making the kosher dill pickles. So, no pounding, and no month’s long fermenting. It also has a different flavour from sauerkraut, slightly more crisp and tangy and not much cabbage flavour. For one person, start with a small firm cabbage. I used a cabbage that was slightly bigger than both my fists side-by-side. Half of this sized cabbage fit well-packed into a jar that was approximately a half pint size (one cup). It is amazing how closely you can pack cabbage slices. I used plain salt for this pickling, but it is not the best option for fermented pickling. A better salt option is either sea salt, or the pink Himalayan salt, basically minimally processed salt is preferable. Minimally processed salt also has many useful trace minerals, which incorporate into the fermented food and increase its nutrient value. Small to mid-sized cabbage, type does not matter. Salt – between a quarter and half a cup (you won’t use it all). A clean half-pint or pint jar, with lid. I used a jam jar, but any glass jar will work. You will also need piece of wood or plastic that fits into the mouth of the jar to hold the fermenting veggies under the ferment liquid. For my fermenting, I cut a piece of plastic from the side of a broken yogurt container. You will also need something to pack the veggies into the jar. I used the handle of a butter knife, a the handle of a wooden spoon or a wooden spurtle would work better. Finally, you’ll also want a flat bowl or plate to rest your fermentation jar on during fermentation, to catch any drips caused by the natural fermentation expansion. If you are worried about introducing the wrong bacteria into your naturally fermented pickled cabbage, you should start by sterilizing your jar, lid, cover, and other utensils with boiling water. Then let them cool before proceeding. Start by washing your cabbage. Some people will recommend that you use only organic veggies in your fermentation. However, you can also use conventionally grown vegetables. The fermentation, by the third day, will have removed any pesticide and herbicide residue that was on the plant. All the same, wash the cabbage as thoroughly as you can. Slice the cabbage as if you were going to make coleslaw. Try to make the strips of cabbage as even as possible. This will help your jar ferment evenly and quickly. Once you have chopped up half of your cabbage, grab the salt. Put a layer of cabbage, packed in to approximately a quarter inch high, in the jar. In a pint sized jar, sprinkle a teaspoon of salt over it. Then put in the next layer of cabbage, pack it in, and put another teaspoon of salt on that. Continue until your jar is packed to just below the shoulder of the jar. If necessary, chop more cabbage to fill the jar. Now, take water, preferably water that has been boiled and cooled, and add just enough water to the jar to bring the liquid level over the level of the packed in cabbage. It should be, maximum, at the top of the jar shoulder. Now, insert your clean piece of plastic to keep the veggies under the liquid while fermenting. If you have some already successfully fermented pickles, sauerkraut, or pickled cabbage, you can add a few teaspoons of the juice to speed the fermentation of this jar. Place the lid loosely on the jar, and set the jar onto your drip catcher. Place the jar in a warm, but easily accessible place. The top of the fridge is NOT recommended. If your house is cold, fermentation of even a small jar will take at least a week to a week and a half. If your house is warm, the fermentation can be finished within three or four days. The bubbles have slowed or stopped. Gases are produced during the fermentation process, when you tap or jar the jar these bubbles will sneak out between the layers of cabbage and be visible as they rise to the surface. When the bubble production slows, you will know that the fermentation is nearly finished. Color, a jar of pickled cabbage should be an even muted green tone, particularly when compared to a fresh cabbage leaf. Finally, it should smell like a nice fermented cabbage pickle. Note: If your ferment has an off scent, either harsh or putrid, or any mold forms on top of the jar, it should immediately be discarded. The jar and lid can be washed, but should be sterilized with boiling water before trying a second ferment in that jar. I would like to clarify one thing, while I like pickles, and pickled cabbage, I actually do not like sauerkraut. I also do not like freshly finished fermenting pickled cabbage. I prefer pickled cabbage after the ferment has finished, and it has had at least a week to mellow in the fridge. This mellowing is important, and is one of the reasons a quick ferment is useful with cabbage. You can always have a few jars on the go, in various stages of fermenting, mellowing, or being eaten. You can also add extra spices, herbs, and even other vegetables to your pickled cabbage ferment. My favorite additions happen to be garlic and dill, or ginger. Spices should be a small addition, not more than a tablespoon being used, per half pint, as many spices have anti-microbial properties that could slow your ferment. 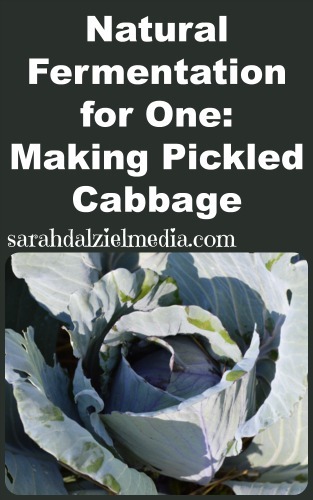 My personal favorite way to eat pickled cabbage is simple. Make a tortilla with cheese melted on top of it, and top that with a few slices of meat and a small forkful of the naturally pickled cabbage. The cabbage adds a nice bit of tangy crunch to the cheese and meat, and is quite yummy. I have also topped soup and chili with a spoonful of the pickled cabbage (don’t boil fermented foods). And of course, eating it straight from the jar can also be yummy. More on the pickled side of things, several times I was starting to feel a little under the weather. I would eat a few small servings of pickled cabbage, or the naturally fermented kosher dills, and by the next morning I would feel as right as rain. What natural fermentations have you tried making? If you try this recipe and method, leave a comment and let me know how it works for you! I love hearing back from my readers.